Entrepreneurship and new business ventures contribute positively to the U.S. economy. MBA in entrepreneurship students learn important fundamentals such as developing business plans, understanding business from conception to execution, and learning how to manage small- and large-scale businesses in different industries. Graduates of these programs are afforded plenty of room to grow, high employment levels, and the ability to adapt to different industries depending on their interests, career goals, and aspirations for growth. Earning an MBA opens up career opportunities and unlocks higher salary potential. Before enrolling in a program, students can explore factors including program cost, course offerings, career potential, and program type. During their program and continuing after graduation, students can explore membership opportunities with various professional organizations relevant to entrepreneurship, providing them with networking possibilities and professional development experiences. 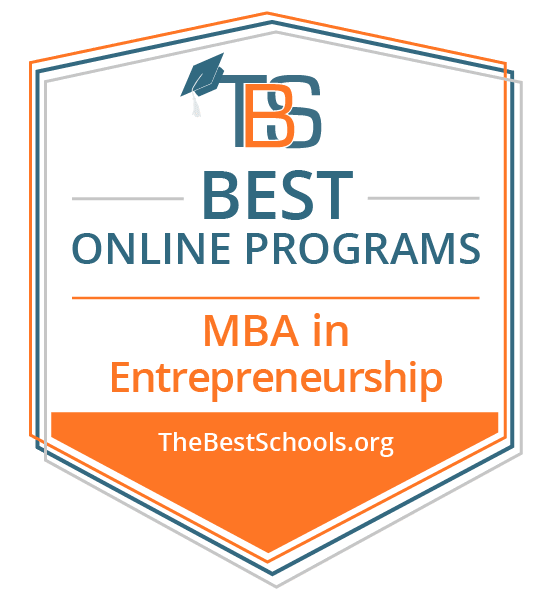 We've selected the best MBA for entrepreneurship students based on the quality of the program, the types of courses offered, the faculty, rankings, awards, and reputation, including the school's reputation for effectively providing online degree programs. University of North Carolina ranks #1 on The 20 Best Online MBA Entrepreneurship Programs! The Kenan-Flagler Business School at the University of North Carolina offers a variety of undergraduate, graduate, and professional degree and non-degree programs designed to meet the needs of students with diverse educational and professional backgrounds. Whether full-time students, or a working professionals, the Kenan-Flagler Business School provides students with programs that emphasize leadership, hands-on experience, sustainable strategy, and global engagement, preparing them for success in the modern world of business. Through several research and outreach centers and institutes, including the Kenan Center and the Center for Entrepreneurial Studies, the Kenan-Flagler Business School provides outreach services to the community, networking and development opportunities to students, and advances research in the field. The University of North Carolina holds membership with the Association of American Universities (AAU), a mark of quality. The Kenan-Flagler Business School offers an online Master of Business Administration degree program, with a concentration in Entrepreneurship, designed to develop industry-specific expertise. The program prepares students to pursue or advance careers as entrepreneurs in a variety of fields. The curriculum combines a strong foundation in strategic leadership and administrative practices with a broad scope of entrepreneurial topics, including managing innovation, corporate strategy, social entrepreneurship and developing economies, discovering new ventures and businesses, and technology management. Taking two classes per quarter, students typically complete the online MBA program in 24 months, but with flexible scheduling, the master's in entrepreneurship program offers students the option to earn their degree in as little as 18 months, or as many as 36 months. University of Florida ranks #2 on The 20 Best Online MBA Entrepreneurship Programs! The Warrington College of Business at the University of Florida offers a variety of undergraduate, graduate, and professional degree and non-degree programs through its three schools: the Heavener School of Business, the Fisher School of Accounting, and the Hough Graduate School of Business. The Warrington College of Business maintains several outreach and research institutes and centers, including the Entrepreneurship and Innovation Research Center, which provide students with opportunities to be involved and network, as well as advance research in the field and provide outreach to the community. The University of Florida holds membership with the Association of American Universities (AAU), a mark of quality. Housed in the Warrington College of Business, the Hough Graduate School of Business offers an online Master of Business Administration degree program, with the option for concentration in Entrepreneurship. An accelerated program, the online MBA takes students 16 months to finish. The program assumes students have already undergone relevant coursework in their undergrad programs. The program requires for admission students have significant, relevant professional experience of at least two years. Ranked as the best MBA for entrepreneurship students online, this program prepares learners to advance their careers in a variety of professional settings through the development of an advanced knowledge base in business administration, management, and entrepreneurship. The curriculum focuses on logistics, finance, strategy, and development at the global scale, the cultivation of strong writing skills, technology management, negotiation skills, and more. The online MBA program requires students attend weekend residencies every four months, as well as a mandatory orientation, on the Gainesville campus. The Hough Graduate School of Business also offers a two-year online MBA program. The University of Florida is accredited by the Southern Association of Colleges and Schools Commission on Colleges. The Warrington College of Business is accredited by the Association to Advance Collegiate Schools of Business (AACSB). Temple University ranks #3 on The 20 Best Online MBA Entrepreneurship Programs! Established in 1918, The Fox School of Business at Temple University offers a variety of undergraduate, graduate, and professional degree and non-degree programs through 10 different departments. The Fox School of Business presents students with numerous developmental opportunities. The Fox School of Business offers an online Master of Business Administration degree program, with a concentration in Entrepreneurship that prepares students to pursue or advance careers as leaders in a variety of professional settings. The curriculum emphasizes a foundation in entrepreneurial theory and practice, leadership development, business strategy, risk management, global business, accounting and more. Students in the online MBA program must also complete a practicum. The online MBA program utilizes a unique four-week model for its courses, students take one at a time. Students must attend a week-long residency at the beginning of the program. Penn State World Campus ranks #4 on The 20 Best Online MBA Entrepreneurship Programs! Penn State World Campus, the online campus of Pennsylvania State University launched in 1998, provides a wide variety of undergraduate, graduate, and professional degree and non-degree programs. In keeping with and furthering Pennsylvania State University's long history with distance education (since 1892), Penn State World Campus offers the same educational quality online as the on-campus programs of Pennsylvania State University, itself a member of the Association of American Universities (AAU). Penn State World Campus offers an online Master of Business Administration degree program with a concentration in corporate innovation and entrepreneurship, lead by the Smeal College of Business at Pennsylvania State University. The program prepares students to pursue or advance careers as entrepreneurial leaders in a variety of fields and professional settings. The curriculum emphasizes theoretical and practical approaches to entrepreneurship, team performance and effective communication, finance and economics in business strategy and operation, ethical decision making and social responsibility, data analysis, and more. Students enhance their ability to act as effective entrepreneurs or leaders in corporate innovation through the development of a broad knowledge base. Students earning their entrepreneurship MBA must attend a five-day residency at the beginning of the program. University of Texas at Dallas ranks #5 on The 20 Best Online MBA Entrepreneurship Programs! The Largest of eight schools at the University of Texas at Dallas, the Naveen Jindal School of Management offers a variety of undergraduate, graduate, and professional degree and non-degree programs in six areas of specialization. The Naveen Jindal School of Management promotes career-readiness in students through the advancement of education, discourse, and research, with plenty of opportunities students may utilize. The Naveen Jindal School of Management's online Professional Master of Business Administration degree program with a concentration in Innovation and Entrepreneurship, offers professionals the flexibility to work full-time while pursuing an advanced education on a part-time basis. The program prepares students to advance their careers through developing a strong foundation in business administration theory and practice. The curriculum includes accounting and finance, strategic management, global business, marketing, organizational behavior, and more. Elective coursework allows students to specialize their study. The University of Texas at Dallas is accredited by the Southern Association of Colleges and Schools Commission on Colleges. The Naveen Jindal School of Management is accredited by the Association to Advance Collegiate Schools of Business (AACSB). Syracuse University ranks #6 on The 20 Best Online MBA Entrepreneurship Programs! Housed at Syracuse University, the Martin J. Whitman School of Management offers a variety of undergraduate, graduate, and professional degree and non-degree programs. The school is home to a variety of research and outreach centers and institutes, including the Falcone Center for Entrepreneurship. The Martin J. Whitman School of Management promotes the advancement of education and discourse in the field, provides community outreach, and presents students with numerous opportunities for networking, growth, and professional development. MBA@Syracuse, the Martin J. Whitman School of Management's online Master of Business Administration degree program with a specialization in Entrepreneurship, prepares students to pursue or advance careers in entrepreneurship in a variety of professional settings, with particular emphasis on global business development and relations. The program culminates in an international three-day residency. MBA@Syracuse develops a strong foundation in business administration and entrepreneurship theory and practice, as well as accounting, global business management, strategic management, legal and ethical concerns and responsibility, and more. Students in the online MBA entrepreneurship program must complete a capstone project. Also, students in the online MBA program must attend three three-day residencies over the course of the program, including a residency at Syracuse, a residency in a different US city (such as Atlanta or Minneapolis) and an international residency in a foreign city (such as Florence or Dublin). Northeastern University ranks #7 on The 20 Best Online MBA Entrepreneurship Programs! The D'Amore-McKim School of Business, part of Northeastern University, offers a variety of undergraduate, graduate, and professional degree and non-degree programs. Home to a number of research and outreach centers and institutes, including the Center for Entrepreneurship Education, the D'Amore-McKim School of Business engages in the advancement of research and discourse, community outreach, and student development through numerous professional and academics opportunities. The D'Amore-McKim School of Business offers an online MBA degree program with a concentration in Innovation Entrepreneurship, designed for working professionals with a minimum of five years of professional experience. The program prepares students through an emphasis on management in the global market, global enterprise, growth and innovation, ethical decision making, knowing and sustaining the market, venture creation, and more. University of Massachusetts, Amherst ranks #8 on The 20 Best Online MBA Entrepreneurship Programs! Housed at the University of Massachusetts, Amherst, the Isenberg School of Management offers a variety of undergraduate, graduate, and professional degree and non-degree programs. With several research and outreach centers and institutes to its name, including the Berthiaume Center for Entrepreneurship, the Isenberg School of Management promotes growth and development in academics and discourse, in students, and the community. The Isenberg School of Management has partnerships with numerous corporations that provide students, both on-campus and online, with financial, academic, and professional benefits. The Isenberg School of Management's online MBA degree with a focus in Entrepreneurship, prepares students to pursue or advance careers as entrepreneurs in a variety of fields. The program covers strategic management practices, business law, ethical decision-making, organizational strategy, human resource management, and more. Though not required for admission, the school recommends applicants to the program have three to five years of relevant professional experience. The University of Massachusetts, Amherst is accredited by the New England Association of Schools and Colleges (NEASC). The Isenberg School of Management is accredited by the Association to Advance Collegiate Schools of Business (AACSB). North Carolina State University ranks #9 on The 20 Best Online MBA Entrepreneurship Programs! The Poole College of Management at North Carolina State University offers a variety of undergraduate, graduate, and professional degree and non-degree programs. With industry partnerships and several research and outreach centers and engagement initiatives, including the Entrepreneurship Collaborative, the Poole College of Management provides students with opportunities to develop professionally through academics, as well as professional experience and connections. Housed in the Poole College of Management, the Jenkins Graduate Schools offers an online Professional Master of Business Administration degree program with an Entrepreneurship and Technology Commercialization depth area focus option. The program provides a hands-on, interdisciplinary educational experience, including team projects with graduate students from other disciplines, and real world experiences with partnered startup firms. The program prepares students to advance or pursue careers as leaders of entrepreneurship in a variety of fields. The curriculum emphasizes real-world experience and practical knowledge, and develops a strong foundation in economics, management, marketing, organizational strategy, cross-discipline collaboration, critical thinking skills, and more. Students in the online PMBA program must complete a practicum and they must complete two, three-day residencies on campus in Raleigh. North Carolina State University is accredited by Southern Association of Colleges and Schools Commission on Colleges. The Poole College of Management is accredited by the Association to Advance Collegiate Schools of Business (AACSB). Oklahoma State University ranks #10 on The 20 Best Online MBA Entrepreneurship Programs! The Spears School of Business at Oklahoma State University, enrolling over 5,000 students across seven different departments, offers a variety of undergraduate, graduate, and professional degree and non-degree programs that cover the scope of business-related fields of study. The Spears School of Business emphasizes real-world experience and results. The school also provides outreach, professional development, and entrepreneurship programs. Housed in the Spears School of Business, the Watson Graduate School of Management offers an online Master of Business Administration degree program with a concentration in Entrepreneurship. The program prepares students to pursue or advance careers as effective leaders and entrepreneurs. The program provides a foundation in administrative theory and practice, including finance, economics, marketing, strategic management, organizational management, and more. Oklahoma State University is accredited by the Higher Learning Commission (HLC). The Spears School of Business is accredited by the Association to Advance Collegiate Schools of Business (AACSB). University of Arizona ranks #11 on The 20 Best Online MBA Entrepreneurship Programs! Established in 1913, and later experiencing growth and name changes, the Eller College of Management at the University of Arizona has over a century of experience in offering a variety of undergraduate, graduate, and professional degree and non-degree programs. The Eller College of Management houses several research and outreach centers and institutes, including the McGuire Center for Entrepreneurship. The University of Arizona holds membership with the Association of American Universities (AAU), a mark of quality. Through the Department of Management and Organizations, the Eller College of Management offers an online MBA degree program with a concentration in Entrepreneurship. The program prepares working professionals to advance their careers as leaders of business and entrepreneurs in a variety of professional settings. The program provides a strong foundation in administrative theory and practice, as well as communication skills, business strategy, accounting and finance, leadership, ethics, and more. University of Illinois at Urbana-Champaign ranks #12 on The 20 Best Online MBA Entrepreneurship Programs! Housed at the University of Illinois at Urbana-Champaign, the College of Business at Illinois, founded in 1915 as the College of Commerce and Business Administration, enrolls around 4,000 students in a variety of undergraduate, graduate, and professional degree and non-degree programs. The College of Business at Illinois, has several research and outreach centers and institutes under its roof, including the Academy for Entrepreneurial Leadership. The college engages in furthering education and discourse in academia and in the industry, and provides students, both on campus and online, with opportunities to grow, connect, and advance in their chosen field. The University of Illinois at Urbana-Champaign holds membership with the Association of American Universities (AAU), a mark of quality. For each specialization in the curriculum, students must complete a capstone project. The online MBA program utilizes asynchronous class models, and a cohort learning approach. The University of Illinois at Urbana-Champaign is accredited by the Higher Learning Commission (HLC). The College of Business at Illinois is accredited by the Association to Advance Collegiate Schools of Business (AACSB). Ball State University ranks #13 on The 20 Best Online MBA Entrepreneurship Programs! The Miller College of Business at Ball State University offers a variety of undergraduate, graduate, and professional degree and non-degree programs which emphasize real-world preparedness in students through experiential learning. The Miller College of Business, through several research and outreach centers and institutes, including the Entrepreneurship Center, presents students with plenty of opportunities for growth and development, through education, networking, and more. Through the Entrepreneurship Center, the Miller College of Business offers an online Master of Business Administration degree program with an Entrepreneurship concentration which prepares students to pursue or advance careers as leaders of businesses or entrepreneurs in a variety of fields and professional settings. The curriculum covers the development of a foundation of managerial theory and practice, gathering and applying statistical information, entrepreneurial leadership qualities, economics and finance, marketing, and more. Drexel University ranks #14 on The 20 Best Online MBA Entrepreneurship Programs! With nearly 4,000 students enrolled, the Bennett S. LeBow College of Business at Drexel University offers a variety of undergraduate, graduate, and professional degree and non-degree programs. Through professional connections, hands-on academic programs, career development services, and research and outreach centers and institutes, the Bennett S. LeBow College of Business provides plenty of opportunities for students to network, grow, and advance. The Bennett S. Lebow College of Business offers an MBA online degree program with a concentration in Entrepreneurship and Innovation Management that prepares students to pursue or advance careers as leaders or entrepreneurs in a variety of fields and professional settings. The program emphasizes experiential learning and develops a foundation in management, leadership in dynamic settings, ethical and legal concerns and decision making, finance and economics, marketing, business strategy, global business relations, and more. Students in the online MBA program must also complete a capstone project. The online program utilizes a 10-week quarter model, with courses starting four times year-round, allowing students the flexibility to complete the program on an accelerated schedule, or at a relaxed pace. Drexel University is accredited by the Middle States Commission on Higher Education (MSCHE). The Bennett S. LeBow College of Business is accredited by the Association to Advance Collegiate Schools of Business (AACSB). Suffolk University Boston ranks #15 on The 20 Best Online MBA Entrepreneurship Programs! Founded in 1937, the Sawyer Business School at Suffolk University Boston enrolls more than 3,000 students in a variety of undergraduate, graduate, and professional degree and non-degree programs. The Sawyer Business School, with a focus on experiential learning and real-world professional connections, and through several research and outreach centers, including the Center for Entrepreneurship, provides many opportunities for students to grow and develop professionally and personally. The Sawyer Business School offers an MBA online degree program with a concentration in Entrepreneurship, developed in partnership with several large corporations in Boston to provide real-world experiential learning. The program prepares students to pursue or advance careers as leaders or entrepreneurs in a variety of fields and professional settings. The MBA program with an Entrepreneurship Concentration contextualizes business in the national and global markets, and develops a foundation in economics, management theory and practice, the application of statistical information, and more. Suffolk University Boston is accredited by the New England Association of Schools and Colleges (NEASC). The Sawyer Business School is accredited by the Association to Advance Collegiate Schools of Business (AACSB). Fayetteville State University ranks #16 on The 20 Best Online MBA Entrepreneurship Programs! Originating as the Division of Business and Economics in 1971, the School of Business and Economics at Fayetteville State University has since grown to offer a variety of undergraduate, graduate, and professional degree and non-degree programs, with its first MBA program in 1987. Committed to serving the needs of a diverse student population in a changing business environment, the School of Business and Economics offers programs that prepare students with a global perspective. The school also provides research and outreach centers and programs, including the Entrepreneurship Initiative, for students to utilize in their growth and development. The School of Business and Economics offers an online Master of Business Administration degree program with a specialization in Entrepreneurship which prepares students to pursue or advance careers as leaders or entrepreneurs in a variety of fields and professional settings. The program focuses on the development of professionalism and self-awareness, leadership and managerial skills, effective communication, business in a global market and in a social context, development of a global perspective, and more. Fayetteville State University is accredited by the Southern Association of Colleges and Schools Commission on Colleges. The School of Business and Economics is accredited by the Association to Advance Collegiate Schools of Business (AACSB). Regent University ranks #17 on The 20 Best Online MBA Entrepreneurship Programs! With a variety of undergraduate, graduate, and professional degree programs and non-degree programs, the School of Business and Leadership at Regent University prepares students to engage in the professional world. In keeping with Regent University's strong Judeo-Christian values and mission, the programs in the School of Business and Leadership emphasize servant leadership and social responsibility through embracing a multidisciplinary and entrepreneurial approach. The School of Business and Leadership offers an online MBA with a concentration in Entrepreneurship degree program which blends biblical principles with contemporary business theory and practice. The program prepares students to pursue or advance careers as leaders or entrepreneurs in a variety of fields and professional settings. The online Entrepreneurship MBA program provides a strong foundation in business and marketing strategy, managerial practices, franchising, advertisement and promotion, ethical decision-making, innovation, communication, finance, and more. Regent University is accredited by the Southern Association of Colleges and Schools Commission on Colleges. Concordia University, Wisconsin ranks #18 on The 20 Best Online MBA Entrepreneurship Programs! Housed at Concordia University, Wisconsin, part of the Concordia University system, the Batterman School of Business offers a variety of undergraduate, graduate, and professional degree and non-degree programs. In keeping with the Lutheran mission of the University, the Batterman School of Business incorporates Christian teachings into its programs, with the intent of producing well-qualified professionals who can lead and succeed through Christian principles and service. Through the Concordia University Online platform, the Batterman School of Business offers an online Master of Business Administration degree program with a concentration in Innovation and Entrepreneurship. The program prepares students to pursue or advance careers as leaders or entrepreneurs in a variety of fields and professional settings. The curriculum focuses on the development of knowledge and skills in economics and finance, management, ethical leadership, accounting, innovation, and more. Concordia University, Wisconsin is accredited by the Higher Learning Commission (HLC). Azusa Pacific University ranks #19 on The 20 Best Online MBA Entrepreneurship Programs! The School of Business and Management, housed at Azusa Pacific University, offers a variety of undergraduate, graduate, and professional degree and non-degree programs which incorporate the University's Christian mission into their curriculums. Dedicated to providing academic excellence and spiritual enrichment for students, and advancing their Christian mission through students, the School of Business and Management offer students the opportunity to develop and grow personally and professionally. The School of Business and Management's online MBA with an Entrepreneurship concentration degree program prepares students to pursue or advance careers as leaders or entrepreneurs in a variety of fields and professional settings. The curriculum builds a foundation in areas such as the administration and entrepreneurship theory and practice, management, accounting, a Christian ethical perspective, economics, personnel management, business in the global marketplace, and more. Students in the program may earn their MBA in as few as 12 months. Classes utilize and eight week model, and start six times per year. University of West Florida ranks #20 on The 20 Best Online MBA Entrepreneurship Programs! The College of Business at the University of West Florida provides students with a variety of undergraduate, graduate, and professional program options in diverse fields of study within business. With on-campus and online program options, the College of Business meets the needs of traditional and non-traditional students. Students in the College's programs benefit from internship, scholarship, and study abroad opportunities, professional development services, and access to outreach programs and research centers, including the Center for Entrepreneurship. The College of Business offers an online Master of Business Administration degree program with an emphasis in Entrepreneurship, designed for working professionals who seek to advance their careers or pursue a new venture. The program develops a strong foundation of knowledge and skills necessary to entrepreneurial success. Students prepare to advance careers as business leaders in wide variety of professional settings. The curriculum emphasizes key topics, such as financial management, marketing strategies, leadership and teamwork, navigating business law and policies, recognizing and pursuing business opportunities, and more. Courses in the online MBA program utilize seven-week terms. Students can complete the program in 16 months. For admission into the program, students must have at least eight years of relevant work experience. The College of Business is accredited by the Association to Advance Collegiate Schools of Business (AACSB). The University of West Florida is accredited by the Southern Association of Colleges and Schools Commission on Colleges (SACSCOC). MBA in entrepreneurship programs prepare students to pursue business and/or product ventures by combining the theory and practice of business administration with entrepreneur education. Entrepreneur education programs focus on the importance of building a strong professional network, securing funding (including venture capital), and organizing and initiating a startup. MBA in entrepreneurship programs cover subjects such as researching and identifying emerging market opportunities, applying innovation to current businesses, revitalizing mature organizations, channeling creativity into daily operations, and further developing critical thinking and analytical problem-solving skills. Plenty of people can think of a potential idea for a business or product, but they may not have the knowledge and skills necessary to make this idea a reality. An MBA in entrepreneurship gives students the foundation to bridge the gap and create successful and sustainable business ventures. Students who earn an MBA in entrepreneurship can partner in a startup or apply their knowledge to help operate and develop an entrepreneurial venture. How Is an MBA in Social Entrepreneurship Different? An MBA in social entrepreneurship provides students with a specific focus on socially conscious enterprises. This degree provides students seeking to develop a company and devoted to serving the community the skills and knowledge needed to actualize this dream. An MBA in social entrepreneurship combines the theory and practice of business administration with entrepreneurship education, adding a specific focus on social awareness and social service. Students who enroll in online programs enjoy unique benefits, some of which can include asynchronous learning, which allows students to complete their work within the constraints of their personal schedules. Some online programs feature synchronous learning, which requires students to watch online lectures at a prescribed time. The Advantages of an MBA in Entrepreneurship? Holding a bachelor's degree in business administration or entrepreneurship allows students to pursue careers as business consultants, sales representatives, research and development specialists, recruiters, and business reporters. Students interested in furthering their career opportunities and exploring higher salary potentials can pursue a master of business administration in entrepreneurship. Graduates of these programs can work as general managers, fundraiser managers, construction managers, and business operations managers. Students can also consider pursuing doctoral education if they want full access to careers in the field with the highest possible salary opportunities. In the following section, students can review careers available to MBA graduates, including salary information and job descriptions. What Can You Do With an MBA in Entrepreneurship? Financial Manager: Financial managers typically work for consulting firms or a specific company across a variety of fields. They help organizations become aware of the risks and weaknesses related to their financial situation. From there, financial managers offer suggestions for how financial goals can be reached. They also derive realistic financial goals that companies or clients should aim for. Human Resources Manager: Responsible for overseeing procedures, policies, and compliance for employees within an organization, human resources managers ensure that all human resources activities within an organization adhere to local, state, and federal laws. They also oversee and implement programs for employee initiatives and benefits including insurance programs, maternity leave, open enrollment programs, and paid time off. Small Business Owner: Working in a variety of industries including auto repair, retail goods, and home inspection, small business owners are responsible for managing their employees, documenting and filing business accounts, promoting their business, and making sure their business satisfies local, state, and federal requirements. Small business owners work in settings including office spaces, storefronts, or their own homes. Business Consultant: Business consultants work with partners to make sure overall business solutions are implemented and positioned on a global scale. Business consultants work to build a rapport with external vendors to support business objectives as well as create and update high-level road maps of business goals and initiatives. They balance customer requirements and requests with technical consultants and make changes to programs to improve their likelihood of meeting business goals. Public Relations Director: These professionals are in charge of handling fundraising as well as directing and planning activities to maintain and solicit funds for nonprofit organizations and special projects. They also direct and plan public relations programs designed to maintain and create ideal public images for clients and employers. Students searching for the right online MBA program should take their time as they research each program that interests them. In particular, they should pay attention to program cost, comparing different schools to understand which program offers the best tuition rates for their expected financial aid. In-state programs tend to be the more affordable option for prospective students, but some schools offer in-state rates to online students regardless of residency. Students can also research transfer policies, school type and size, program length, on-campus requirements, and graduation requirements. Students should be particular and precise in their search to find the online program that fits their unique needs. Program Cost: Students considering enrollment in online MBA entrepreneurship programs should consider program costs at each college and university they are interested in. Program cost varies depending on the institution and the amount of financial aid received. Transfer policies: Students who might need to transfer to another school at some point during their program should review their school's transfer policies as well as those at competing schools. School Size and Type: Smaller class sizes denote more individualized programs, so students can pay attention to the class sizes featured at each college and university to determine whether they will get the one-on-one attention they desire at a particular program. Additionally, students should review whether their college of interest operates as a public or private institution, differences in accreditation, and program quality. Program Length: The time it takes a student to graduate will depend on whether they are enrolled full time or part time. Furthermore, some programs require students to maintain full-time enrollment and follow a cohort format, completing courses at the same time as fellow classmates, while others take an asynchronous approach and allow students the flexibility to complete courses at their own pace. On-campus Requirements: Many online MBA entrepreneurship programs feature programs delivered entirely online. Some programs, however, might require students to complete on-campus requirements including courses, seminars, orientations, final presentations, and internships. Students can review program requirements before enrolling in case they do not have the ability to fulfill on-campus requirements. Thesis, Fellowship, and Work Requirements: Each program features its own graduation requirements. Many programs require students to finish a thesis or capstone project, and some require students to complete fellowships or in-the-field experiences. Students can review online MBA program features here: https://thebestschools.org/online-colleges/#by-state. Students interested in earning an online MBA entrepreneurship degree should ensure the program they enroll in is accredited. There are two main types of accreditation: regional and national. Students attending nationally accredited institutions typically focus on coursework geared toward technical and career training and topics. In these institutions, students do not generally complete liberal arts-based coursework. Nationally accredited programs often carry lower tuition rates than regionally accredited programs do, but they also tend to get excluded from many tuition reimbursement plans. Credits do not always transfer easily from nationally accredited institutions, so students planning on furthering their education or pursuing certain certifications should consider the transfer requirements before enrolling in a nationally accredited college or university. Regionally accredited institutions focus primarily on liberal arts-based coursework. Although these institutions often charge higher tuition rates than nationally accredited colleges and schools, they get included in most tuition reimbursement plans and credits are more easily transferred. The U.S. Department of Education (ED) and the Council for Higher Education Accreditation (CHEA) both play important roles in accreditation. Though the ED does not administer accreditation, it does oversee accrediting agencies to ensure quality education is maintained across accredited programs, setting standards and ensuring programs meet those standards. CHEA operates as an organization of degree-granting colleges and universities. Students can access the ED's website or CHEA's website to access a list of all of the accredited schools in the United States. How Long Does It Take to Complete an Online MBA in Entrepreneurship Degree? Students pursuing their online MBA entrepreneurship degree encounter different factors that may impact their program length. Typically, full-time students take two years to finish their online MBA program. However, part-time enrollment functions as a great option for students who need the maximum amount of flexibility within their online MBA. For students who want to earn their MBA as quickly as possible, many colleges and universities offer online MBA entrepreneurship programs in accelerated formats. Students enrolled in accelerated programs can double-up on the amount of credits they complete each semester to finish their program in under two years. In the leadership and teams course, students integrate and develop fundamental behavioral concepts and theory with administrative applications. Initially, the course focuses on the individual decision maker and progresses into organizational, interpersonal, and social influences and structures, teaching students to develop methods and strategies of research on behavioral business applications. Students in the managing organizations course analyze and examine the organization as a social system, noting the impact of its various components on work behavior and attitudes. Topics in the course include policy formulation, leadership, and change; organizational effectiveness; and the development of organizational structures. Focusing on introducing students to the concepts used as they work to understand buyer behavior and marketing systems, the marketing management course allows students to develop their skills in making intelligent marketing decisions. Students take a primarily managerial approach to their coursework and use examples from both non-business and business contexts. In the managerial accounting course, students gain an introduction to management accounting as it functions in their firm's information system. Course topics focus on budgetary systems for controlling and planning business operations as well as modern cost accounting. Enrolling in an investments course provides students with an introduction to investment analysis focusing on the implementation and theory of portfolio theory. Students also explore empirical evidence as it pertains to how financial assets perform and learn to evaluate portfolios for investment strategies. Additionally, students learn about diversification within international markets. American Management Association: Known for being a world leader in professional development, the American Management Association focuses on advancing the skills of business professionals to drive business success. The organization promotes experiential learning, and members enjoy access to webinars, conferences, and podcasts. Entrepreneurs' Organization: A global, nonprofit organization, the Entrepreneurs' Organization was founded in 1987 as the Young Entrepreneurs' Organization. Today, it features a global business network of more than 13,000 leading entrepreneurs in 58 countries and 186 chapters. The organization allows business owners to learn from one another, resulting in greater business success. Young Entrepreneur Council: A nonprofit organization, the Young Entrepreneur Council serves entrepreneurs younger than 40. Members of the organization enjoy peer-to-peer forums, providing them with 24/7 support. Members also experience beneficial products and services, access to an editorial team to help them with content creation and distribution, and in-person events. Edward Lowe Foundation: The Edward Lowe Foundation was founded in 1985 to leverage entrepreneurship as a strategy for community development and economic growth. Unlike most U.S. foundations that function as grant-giving entities, the Edward Lowe Foundation funds its own programs. The organization focuses on growth-oriented firms that have graduated from start-up but haven't yet grown to maturity. United States Association for Small Business and Entrepreneurship: This organization focuses on four main pillars: entrepreneurship research, entrepreneurship education, public policy, and entrepreneurship outreach. Members enjoy access to an annual conference, collaborating with their peers to develop their skills and knowledge, as well as an entrepreneurship journal.